"No talks with Raila Odinga, Chebukati bother himself with baseless dialogue." DP William Ruto says. - Bana Kenya News, Real African Network Tubanane. Home featured News "No talks with Raila Odinga, Chebukati bother himself with baseless dialogue." DP William Ruto says. "No talks with Raila Odinga, Chebukati bother himself with baseless dialogue." DP William Ruto says. Speaking in Nanyuki, the Deputy President William Ruto said that the IEBC Chairman Wafula Chebukati is disturbing himself as Jubilee will not hold any talks with anyone. about 26th October 2017 elections. DP Ruto warned the IEBC that they will need to prepare elections only in that day not organizing a room or a roundtable dialogues. "We cannot assemble on a table and discuss with Raila Odinga about forming whatever, what we can discuss is the retirement benefits of Raila Odinga and send-off package to Bondo." DP Ruto said. 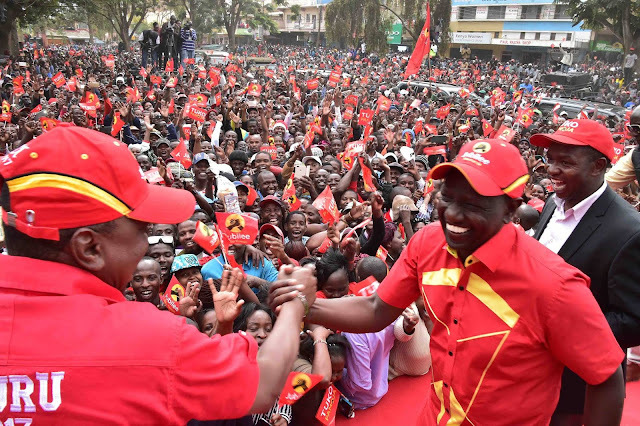 Ruto told a rally in Nanyuki that the government will only talk with the opposition leader after the October 26 presidential repeat poll to discuss his send-off package. IEBC chairman threatened to resign if the country will continue being polarized by Politician and sabotaging the October polls. The President seconded the statements done by his deputy William Ruto that they will never gather around a table with him. "If his dream is to go to a roundtable for dialogue with him so that we have a half carpet government then he is building castles on air. We are not going to accept that and if IEBC Chairman Chebukati goes the saying ways then it is his problem. What we need is Elections on 26th October 2017" President Uhuru Kenyatta said.